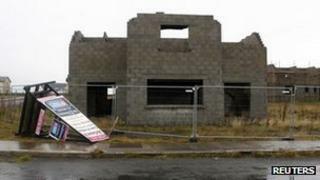 The Republic of Ireland fell back into recession in the last three months of 2011, official figures have shown. Its economy shrank by 0.2% from October to December, following a contraction of 1.1% in the third quarter. The data from the Central Statistics Office showed that the weakness in the global economy had hit Irish exports, while its domestic consumer spending had continued to recover. The country needed an international bailout in 2010. While consumer spending in Ireland rose by 0.5% in the fourth quarter of 2011, exports fell by 1.1%. Irish economist Conall Mac Coille, of Davy Stockbrokers, said: "Consumer spending and investment bounced back as we expected, but exports contracted on the quarter, highlighting the danger that a key platform for growth is being eroded by the euro area slowdown." In November 2010, the Irish government was awarded 85bn euros ($112bn; £71bn) of emergency loans from the International Monetary Fund and European Union, as it struggled to cope with big debts and the high cost of its borrowing. The Irish government also secured a loan from the UK. Once known as the Celtic Tiger because of its strong economic growth, fuelled by low corporation tax rates, the Republic's financial woes were centred on the bursting of a property bubble. This left the country's banks with huge liabilities, and the banks subsequently had to be bailed out by the government, putting extreme pressure on the state's finances.